I was reminded earlier today that many people don’t know where to turn for resources about guardianship in South Carolina. Cue Frequently Asked Questions in Probate Court. (4) NOTE: There are also videos about both Guardianship and Conservatorship in South Carolina. While they were produced a few years back, the law is still good. This is a reprint of an article appearing in the SC Center for Fathers and Families enewsletter. The South Carolina Attorney General recently issued an opinion that civil contempt findings should not appear on South Carolina Law Enforcement criminal background checks. This opinion will have a favorable impact on non-custodial parents who have been found in civil contempt for failure to pay child support and have had the finding entered into their criminal record. Although civil contempt is not a crime, procedures at SLED did not allow these actions to be excluded from the records. The procedures for expungement only applied to criminal cases. The Center for Fathers and Families has long advocated for changes in policies and practices that though well-intended created roadblocks for non-custodial parents, mostly fathers, being able to provide for their children. This practice of recording civil findings in a criminal background record was one such unnecessary barrier. The Center had several concerns. First, a criminal background is often a barrier to employment and because civil contempt findings appeared on the criminal background checks, employers viewed it as a criminal offense. Gaining and maintaining employment is critical to having the financial means to meet a child support obligation. Second, only individuals who were found in contempt of non-payment of child support and were fingerprinted had the civil contempt entered into their criminal record. Finally, the practice of fingerprinting individuals found in contempt and forwarding those records to SLED was inconsistently applied across the state. Because SC Legal Services shared these concerns, The Center and SC Legal Services partnered to address this growing problem. A non-custodial parent, and in this case a mother, requested SC Legal Services’ assistance to have her more recent civil contempt for failure to pay child support removed from her SLED criminal record. Her criminal record included some criminal offenses, but these were very old and ironically were not hindering her employment chances as much as the recent incarceration for failure to pay child support. This case highlighted the problem of civil contempt on criminal records and its impact on individuals’ employment opportunities. SC Legal Services submitted a written request to SLED for the removal of the civil contempt and the request was denied. SLED procedures were to record any offense that was a “fingerprintable” action and the expungement process could not be used because it was a civil, not a criminal, action. However, because this case demonstrated the problem of civil contempt in individuals’ criminal records and the lack of internal procedures at SLED to address removal of civil contempt findings, SC Legal Services Lead Employment Attorney Jack Cohoon filed an Administrative Appeal to SLED’s Criminal History Administrative Appeal Board. SLED then requested an opinion from the Attorney General’s office concerning entering findings of civil contempt into SLED criminal records. The Attorney General’s opinion was issued on October 8, 2012. This opinion concluded that criminal records are maintained for criminal justice purposes. Since reporting civil contempt findings does not advance or relate to the enforcement of the criminal laws of South Carolina, these civil contempt findings are not criminal history and should not be entered into the State’s Criminal Information and Communication System nor in the federal NCIC ( National Crime Information Center) systems. Because of this opinion, SLED will no longer enter civil contempt orders into the NCIC and state systems. The Center is grateful to the partnership and support of SC Legal Services and for the favorable and fair opinion by the Attorney General. The full opinion may be found here. Make plans now to eat dinner out this coming Wednesday, July 18, 2012, between 5-9 p.m. at Salsarita’s Fresh Cantina located at 5135 Sunset Blvd. Suite H, Lexington, SC 29072. 10% of all ticket sales will be donated to Richland County CASA in support of abused and neglected children! Come On! 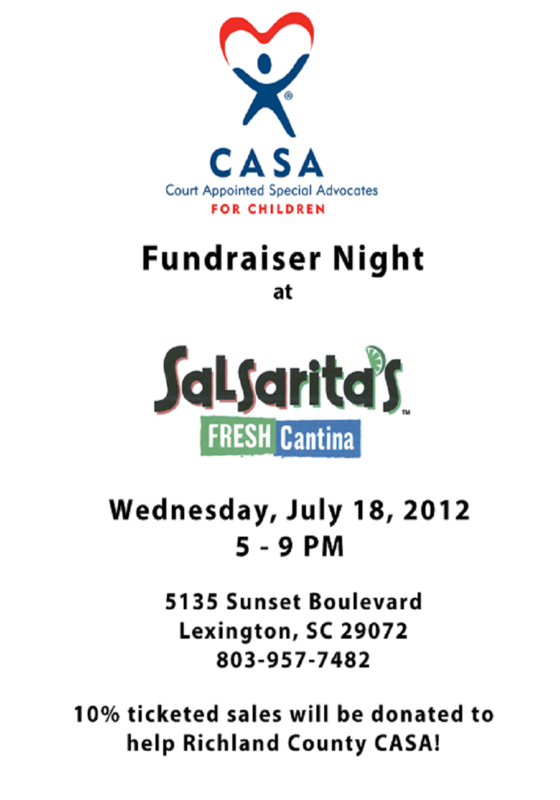 You have to eat anyway, so make it a night out and support the CASA Children! Can’t think of a better reason to eat good food and help a cause! See you there. I am pleased to announce that there will be a Court Interpreter Certification Program, Two-Day Orientation Workshop (Language Neutral) presented by South Carolina Court Administration in Columbia, South Carolina on Friday, June 1, 2012 and Saturday, June 2, 2012. The sessions will run all day, from 8:30 a.m. to 5:00 p.m. on both days. Friday, June 1 and Saturday, June 2, 2012, 8:30 a.m. – 5:00 p.m.
For more info, Invitation to Orientation 06.01.12.